May 19, 2014, 11:40 AM · Commissioning a piece of music from a composer isn't exactly like ordering a hamburger from Burger King -- you can't just order it your way. It's more like ordering from the tasting menu at the finest of restaurants -- you let the chef choose the ingredients and wow you with his or her creation. If all the elements come together, it may even change your perspective on food forever (spinach ice cream, who knew?) But you do have to choose a chef that you trust. This is something violinist Nadja Salerno-Sonnenberg has come to understand after many years of working with composers and premiering their works. Recently she and her band, the San Francisco-based New Century Chamber Orchestra, have released an album of all newly commissioned, 21st-century violin concertos written for her. The recording, A to Z, includes four pieces composed over the last six years by composers Clarice Assad, William Bolcom, Michael Daugherty and Ellen Taaffe Zwilich and premiered by her with New Century. "I added a 'Featured Composer' element to our season when I became music director at New Century," Nadja said. "Basically, you pick a composer and perform an existing work of that composer, then you commission that composer to write something new for the group. How did she choose the composers? "I came into my job at New Century with so much experience and history with lots of different composers," Nadja said. "What was important for me was the style in which a composer writes, whether or not I had a relationship with the composer in the past, and if I think I can communicate well with the composer. That's how I've chosen them." And they've ranged in experience from a Pulitzer-prize-winning composer to an up-and-comer -- "It's been wonderful that way." "When I spoke to these composers," she said, "most of them wanted to write a violin concerto for me. I said, 'You don't have to, you can write anything!' But they wanted to write a violin concerto, so that's how these pieces came into existence." Each piece was written for solo violin and chamber ensemble, but that's where the similarities ended. Each composer had his or her own ideas, inspiration and process. "It's very important, when a composer gets a concept in their head, you cannot talk them out of it," Nadja said. "I remember this from my very first experience working with the Assads, that Sérgio (Assad) wrote this music for the three of us, for our first album, and he had Gypsy stuff in his head, and I had Baroque stuff in my head. But the composer is the creator, the composer is the genius in that sense. You have to let them go with that." Nadja had never worked with composer Ellen Taaffe Zwilich, who "went right for the Italian thing," said Nadja. In other words, Nadja's Italian background, bravura playing style and dramatic personality onstage led Zwilich to the concept of "Commedia Dell'Arte," a piece based on three stock characters typically featured in that particular Italian theatre style. "Ellen just said, 'I cannot get these characters -- Colombina, Arlecchino and Il Capitano -- I cannot get them out of my head because I think of you when I see them.' So she went with that, and she wrote a marvelously visual piece, which is also very, very difficult," Nadja said. "But I would say it's also the most fun." Each character has an instrument -- a slapstick for Arlecchino (the origin of the term "slapstick" comedy); a tambourine for Colombina and a toy drum for Il Capitano. That meant that orchestra members had to play those percussion instruments. "They were really good sports about it," Nadja said. "It was just hysterical to see Michelle (Djokic) handling that tambourine; she's a cellist, and trying to be musical, and Dawn playing that little toy drum -- it was really a marvelous experience. And (Zwilich) totally captured the character of the Commedia dell'Arte - the Captain, who's just a boastful idiot, and Colombine, and Harlequin who was just kind of an imp. She's wonderful at writing music that colors in that character." When it came to composer William Bolcom, who wrote "Romanza" for Nadja, it was a matter of just trusting the "chef." "He knew my style, he knew my playing. He had written for me before, written a sonata for me. I played his violin concerto. So we certainly know each other well enough," she said. "He wrote this piece called "Romanza," and each of the movements is very different in character and style. That's very typical of Bill; I love that about his writing. I had very, very little input into that piece. Basically I just asked him, Can you do this, do you have the time? Will the piece be ready by such-and-such a date? And the answer was yes. He sent the first movement ("Romanza"), which is the most complex, the most contemporary you might want to say, and the longest. Then the other two ("Valse Funébre" and "Cakewalk") came later. "Cakewalk" is so fun, though quite hard for the orchestra! So I just trusted Bill to write for me, because we had a history together, and I knew he would write a piece like that. Composer Michael Daugherty's "Fallingwater" is a tribute to American architect Frank Lloyd Wright, inspired by a visit by to Taliesin, Wright house in Wisconsin, and by three other of his buildings: Fallingwater (a house poised over a waterfall), Unity Temple and the Guggenheim Museum. "Michael had gone to see Frank Lloyd Wright's house, and he saw a music stand that he had designed and had built. It was one piece of furniture but circular, in the way that four people could play chamber music. He was so inspired by that," Nadja said. "Again, that's what was in his head, and so that's what he wrote about," Nadja said. "I think Michael Daugherty is one of the greatest orchestrators of our time. And a very fun composer to play, for me." "I have to play this music, I have to bring it to life, and so I would like to enjoy it," Nadja said. "Sometimes contemporary music is so brilliant, but not at all gratifying to play, and that was not the experience I wanted to have. And that's also very much the reason why I chose the composers that I chose. Because (in their music) there's a form, there's a story told, there is something that I myself can grab and relate to the audience." Daugherty also was Clarice Assad's teacher, and Clarice is the final composer represented on the album. 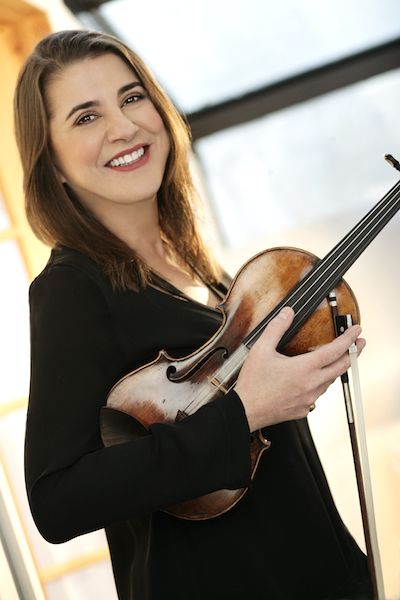 "The concerto that she wrote for me years ago, the Concerto in D Major, was her master's thesis, and she was studying with Michael Daugherty at the time at the University of Michigan when she wrote that concerto," Nadja said. "I loved that it all comes together." Clarice Assad's "Dreamscapes" actually did stem from an idea presented by Nadja, who was looking for pieces to fit a concert theme: music about night time. So far, Nadja had come up with Eine Kleine Nachtmusik, Die Fledermaus and even Bernard Herrmann's "Psycho" suite. Then, "I asked Clarice, can you compose something really visceral that goes deep into a dream?" Nadja said. She wanted it to take the listener from the moment you go to bed, when you're completely awake, then as the body flips into REM sleep. "She took on the challenge, and I think it's brilliantly written. Once you're in that REM sleep, the dreams you dream are romantic and lush -- and scary and crazy. That's what that piece is." "There's a passage that is the most driven, wild music, certainly of the whole album, without a doubt. I remember the orchestra was so pumped to play it. There's even the moment toward the end where you wake up -- very shocked. It was just fun to look at what she wrote and visualize that this was happening." As for the process of interpreting something that has never been played, a brand-new work is "pretty much like in any new piece that you learn that you haven't played before, even if it's a standard repertoire piece: the basic, number-one step is that you have to learn the notes," Nadja said. "That means fingerings, bowings, the A-B-C's of it. Depending on your access to the composer, you may have a lot of input from the composer, or not any at all. Also, the composer may be very willing to collaborate with you, or not. This is all personality differences." "After you learn the notes, you may have an idea about what something should sound like, or the character of the piece. But since it's the first performance, you want to kind of get that visa from the composer that says, 'Yes, that's what I meant, and this is what I'd like to convey,'" she said. "And so that's why it's good to have the communication with the composer for the first performance. Having said that, my experience with composers is that they want me to put the character there, that's why they write the piece for me. I can go to (composer) Bill (Bolcom) and say, 'What the hell were you thinking when you wrote this passage here? I don't know what to do with this!' And he can say, "Well I was hoping that you would figure it out." (She laughs) Depending on your relationship with the composer, sometimes you have the full responsibility of literally coloring in the palette of this piece. Then at other times, you'll be guided by the composer." "It's a wonderful process but also a huge responsibility. You put it out there, and you can only hope that the composer is listening to this and thinking, 'I'm very pleased with this.' Or, 'Oh my god, this is not what I expected at all!'" All the pieces in A to Z are published works, "they're out there now for everyone," Nadja said. "After (you premiere a piece), the piece is out in the world for anyone to play," Nadja said. "That's why I wanted to record these pieces, so that they're there, and people can hear how fantastic they are. I hope that they have a wonderful life after my premiere of them."